The Journal of Great Lakes Research identified a University of Toledo ecologist’s “high-quality research” on harmful algal blooms as one of its five most highly cited papers for nearly three years. In 2013, the quarterly journal published the paper titled “A Novel Method for Tracking Western Lake Erie Microcystis Blooms, 2002-2011,” by Dr. Thomas Bridgeman, UT algae researcher and associate professor of ecology. 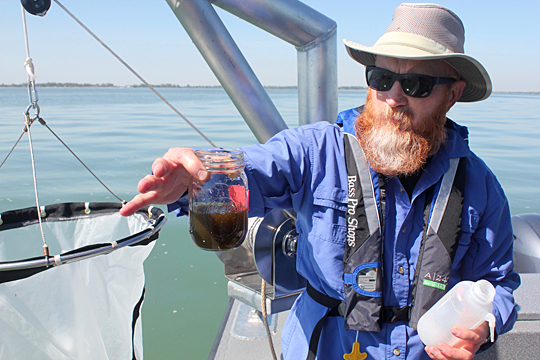 Dr. Thomas Bridgeman held a jar containing concentrated algae pulled up last spring from Lake Erie using the plankton net hanging on the side of the boat. In mid-May, the golden algae called diatoms is good for the lake, according to the researcher. Bridgeman’s paper was cited 33 times between January 2014 and June 2016, according to Scopus Article Metrics. It ranks in the 98th percentile compared to aquatic science articles of the same age. Bridgeman and his students developed a new method to measure how much harmful algae there is in the lake over the course of the summer and compared the harmful algal bloom from one year to another. In the paper, Bridgeman included data on a decade of harmful algal blooms in Lake Erie from 2002 to 2011. “The widespread use of Dr. Bridgeman’s work demonstrates that UT research is integrated into the region,” said Dr. Tim Fisher, geology professor and chair of the UT Department of Environmental Sciences and interim director of the Lake Erie Center. Bridgeman’s research was a major contribution to the development of models that directly link the size of the annual harmful algal bloom with the amount of spring and summer phosphorus discharge from the Maumee River. This entry was posted on Friday, February 3rd, 2017 at 3:48 am and is filed under Natural Sciences and Mathematics, News, Research, UToday .